This could very well be innovation in printed press media. 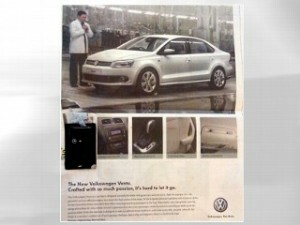 Two prominent Indian news papers, The Times of India and The Hindu had a special advertisement in their daily papers Tuesday morning that launched Volkswagen’s new sedan, the Vento. When readers opened the newspaper to the back page, they activated the light-sensitive chip that began reading the advertisement. This new ad dubbed as a “talking” advertisement which is basically an audio rendering of the print commercial seemed similar to a typical radio ad. The new campaign although innovative had mixed responses in different parts of the country. Users were startled to hear the voice and some even complained to the police. Many of the complaints came from elderly Indians who were frightened of the talking news paper. This innovative idea was created at the ad agency MediaCom. Volkswagen India is competing in one of the worlds most competitive automobile markets urgently needed a completely different marketing campaign that would create enough buzz in the country. 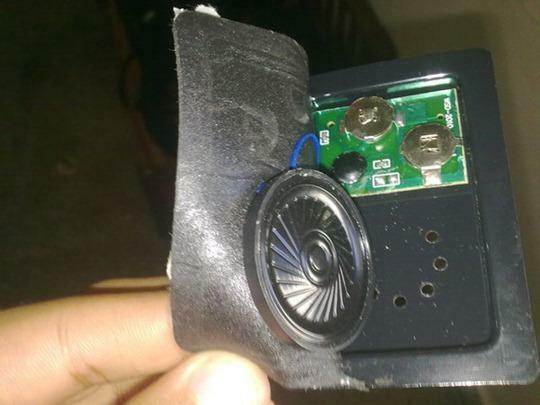 The embedded device was worked on for the past six months and weighs only an ounce and is about the size of an iPod. Once activated it plays the recorded message and runs for a little over two hours before its battery dies out. It was made at the Volkswagen factories in China. The seriousness of startled readers was realized when in Mumbai, a police bomb squad was called when a passerby complained of noises coming out of discarded newspapers in trash cans. The police did release a statement asking people not to be fearful of the new technology. There were about 2.2 million copies that were distributed across the nation. Some users did not appreciate the campaign. Some complained to the news papers about the trouble they had to go to shut the device. Volkswagen did not say anything about how much the device costs. This is a major comeback in the tablet era. When Internet and other technologies threaten the print media, innovations like these will act as a much needed lifeline.